What is VATA, PITTA, KAPHA? According to Ayurveda all bodily substances are divided into five elements: ether, air, fire, water and earth. These elements are formed into three doshas: Vata, Pitta and Kapha. Doshas are responsible for bodily functioning. Ideal situation is when all three doshas are balanced, however there is usually one or two doshas which dominate. Medical practitioner will determine which dosha is increased after thorough consultation. The dosha can be reduced with proper diet, massages, yoga and meditation. A medical practitioner from India. The Ayurvedic therapist graduated of a secondary medical school and is a bachelor’s degree graduate in Ayurvedic medicine. 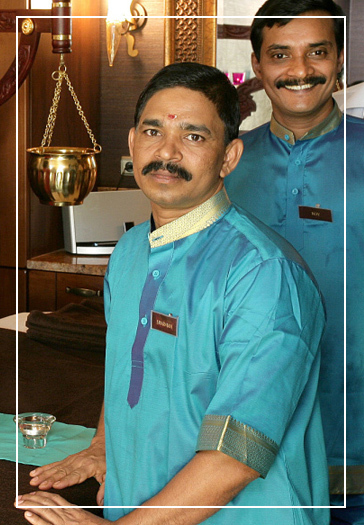 Personally, we have chosen the best one to help you find the balance of your body, mind and soul. Releasing relaxing oil whole body massage 60 min. 55 € / pers. 44 € / pers. ABHYANGAM AND FEET REFLEXOLOGY MASSAGE 75 min. 70 € / pers. 57 € / pers. Massage with pressure acting at special points in the human body 90 min. 75 € / pers. 60 € / pers. Head, neck and shoulder massage with healing oils - cures insomnia. 30 min. 39 € / pers. 31 € / pers. FEET REFLEXOLOGY MASSAGE 60 min. 49 € / pers. 39 € / pers. BACK MASSAGE 30 min. 35 € / pers. 28 € / pers. BACK MASSAGE WITH KIZHI 45 min. 45 € / pers. 36 € / pers. MASSAGE WITH KIZHI - WHOLE BODY 90 min. 80 € / pers. 64 € / pers. FEET AND KNEE MASSAGE WITH KIZHI 45 min. 45 € / pers. 36 € / pers. SPECIAL RELAXING MASSAGE 75 min. 65 € / pers. 52 € / pers. For ladies – (head, neck, face with ayurvedic cream) 30 min. 35 € / pers. 28 € / pers. From 5 years 30 min. 30 € / pers. 24 € / pers.